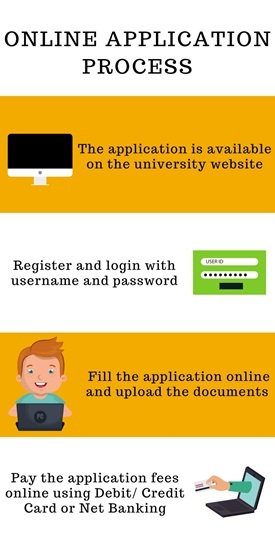 The application form is available on the official website of SRM University, NCR Campus, Ghaziabad. Click the 'Admission' tab and select the 'Apply' tab to the relevant course preferred for the admission. Register with the Email Id and log in with the Username and Password provided to the registered Email Id. Pay the application fee of INR 1100/- Online Using Debit/ Credit Card or Net Banking. Alternatively, draw a DD of INR 1100/- in favour of "SRMIST, payable at Chennai". The online form can be filled, downloaded and taken a print out of. Change in E-mail ID after registration will not be permitted. The admission process will be based on marks secured in SRM JEEE/ JEE-Main Entrance Examination. The admission process is based on marks secured in SRM CAT/ CAT/ MAT Entrance Examination. The admission process is based on performance in the Personal Interview conducted by the SRM University, NCR Campus. The admission process is based on the marks secured in GATE Entrance Examination. The admission process is Merit-based on marks secured in the previous qualifying examination. In order to get through SRM University, NCR Campus admissions 2019 the candidate should have passed 10+2 examination with Mathematics, Physics, and Chemistry as a mandatory subject with minimum 50% marks. The candidate should appear for SRMJEEE Examination conducted by SRM University or JEE-Main Entrance Examination. 10+2 with 50% aggregate marks with Physics, Chemistry, Mathematics from a recognized Board. In order to get admission in SRM University, NCR Campus, the candidate should have passed a Bachelor's Degree in any discipline with minimum 50% marks. The candidate should appear for SRM CAT Examination conducted all over India or must have a valid score in CAT/ MAT Entrance Examination. In order to get admission in SRM University, NCR Campus, the candidate should have passed 10+2 in Academic or Vocational stream with minimum 50% marks. 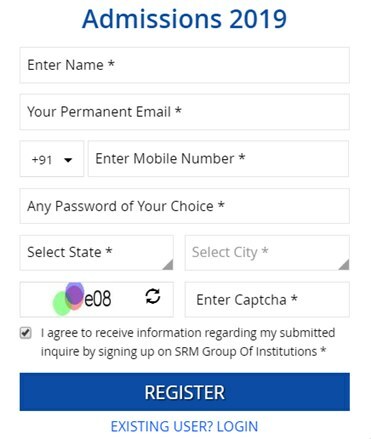 In order to get admission in SRM University, NCR Campus, the candidate should have passed in 10+2 examination with Mathematics and Computer Science as a mandatory subject with minimum 50% marks. In order to get admission in SRM University, NCR Campus, the candidate should have passed in 10+2 examination with minimum 35% from a recognized Board of Education. In order to get admission in SRM University, NCR Campus, the candidate should have passed a Bachelor's Degree with 50% average in any discipline recognized by State/ Central University. In order to get admission in SRM University, NCR Campus, the candidate should have passed BCA/ B.Sc CS/ B.Sc IT recognized by State/ Central University. The candidate should appear for SRMJEEE PG / GATE / TANCET 2019 Entrance Examination. In order to get admission in SRM University, NCR Campus, the candidate should have passed BE / B.Tech in CSE / IT / ECE / EEE / E&I & ICE or MCA or M.Sc CS / CST / IT / SW with 50% aggregate marks. In order to get admission in SRM University, NCR Campus, the candidate should have passed BE / B.Tech in ECE / EEE / E&I / CSE / IT or M.Sc Electronics/ M.Sc Applied Electronics or M.Sc Physics - Special Electronics with 50% aggregate marks. There was SRMJEEE entrance examination for SRM university. I secured 27,000 rank(approx) and got admission into the civil department in NCR campus. The eligibility criteria are to have 12th standard pass percentage as 65% without any Arrears. Generally, they take students up to 35,000 rank. Eligibility criteria is that they must have secured 55% marks in physics,chemistry,maths. Admission is done through entrance exam or by management quota. Eligibility criteria is that you should pass class 12 (PCM) with 75℅ aggregate for SRM University. SRM-JEEE entrance examination is required. Typical cut-off rank is below 40,000. In SRM admission is being done on the basis of the SRMJEEE rank and according to it, streams and campus are decided. And eligibility criteria for SRM is to secure a minimum of 65% in each subject of PCM. The eligibility criteria were to get more than 60% in 12th boards. The entrance exam is mostly online. There are different cutoffs but for CSE you need a rank under 60000. The eligibility depends on rank we scored and on the basis of rank you got, they call you for counseling. I have taken SRM exam and the cutoff is 70000. The eligibility criteria were to secure 55% in PCM and 60% overall. I took SRMJEEE entrance exam which is conducted every year. I don't know about the cutoff. To get admission in this college students needs to write entrance exam conducted by college and must have pass 12th boards with good marks. The student must pass the 12th grade with the percentage above 55% and JEE Main is the entrance exam to get the admission in this college. The candidate must clear the SRMJEEE exam and must have passed the 12th from a recognized institute. Minimum 60% cutoff mark is required. You must qualify the 12th with marks about 50%. The SRMJEEE exam will be held and admission is within the 100000 ranks in SRMJEEE. For my course, we have to first clear the entrance exam conducted by the university. Once cleared, then a merit list is generated. I gave the entrance exam called SRMJEEE. The eligibility criteria were 60% in 12 board. The typical cutoff is 150. The student must have a good percentage to get an admission into the college. To get admission here student needs to clear SRMJEEE entrance exam. The entrance exam for SRM is SRMJEEE 2018, by giving it you are allowed to get into this college. Rank below 1,00,000 in SRMJEEE entrance test is able to get admission in the college. SRM Institute of Management and Technology is very nice.